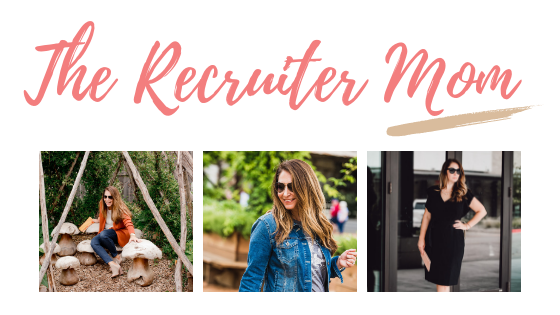 When I started this blog I had the intention of showing “work” clothes mostly for a corporate business professional environment but many of my friends told me that they needed some business casual looks. Today I have a great inexpensive option for you, I went for a look that incorporated a good pair of jeans that can be dressed up or down depending on the situation (but did not have any distressing for my teacher tribe). Now I am going to tell you my truth, until recently I had not bought jeans at Old Navy. I have paid wayyyy too much at times trying to get a fit that would work for my shape, I am 5’5 and typically a size 10 with thicker thighs and a smaller waist. I’ve had two kids so any jeans that are “low cut” are just asking for my mama pooch to come falling out unexpectedly. When I headed over to Old Navy I tried on several pairs until I found the Mid-Rise Curvy Skinny Jeans in Dark Rinse color $39.99. They have a great skinny style that has a mid-rise in a dark wash that makes them a great business casual option. I got a 10 short and with the short length option it hit right at the ankle perfect for heels and flats. Then I found this Ponte-Knit blazer $44.99 but obviously it’s been popular because in the store they only had it in a large. I definitely needed a medium (my typical size) because the back was really loose and the arms were a bit long in the large. In all the pictures I have the arms ruched up a bit but they are a full length. If you are in a business professional environment this jacket also looks amazing with this LOFT sheath dress $89.50. The heels in the picture are from last year but these new Sam Edelman Pumps in Dark Cherry Patent Leather would be gorgeous! The final few pieces that pull this look together are the Flutter Sleeve Button Front Blouse $32.99 which is a great short sleeve blouse that is true to size (I’m in a medium). It has touches of red, yellow and pink to match with a ton of fall blazers and cardigans. I was super impressed by these cute pointed toe flats $22.99 because they are not only cute but did not rub or give me a blister like a ton of inexpensive shoes do! Plus all those are that are still on the hunt for an inexpensive pair of leopard flats check them out. 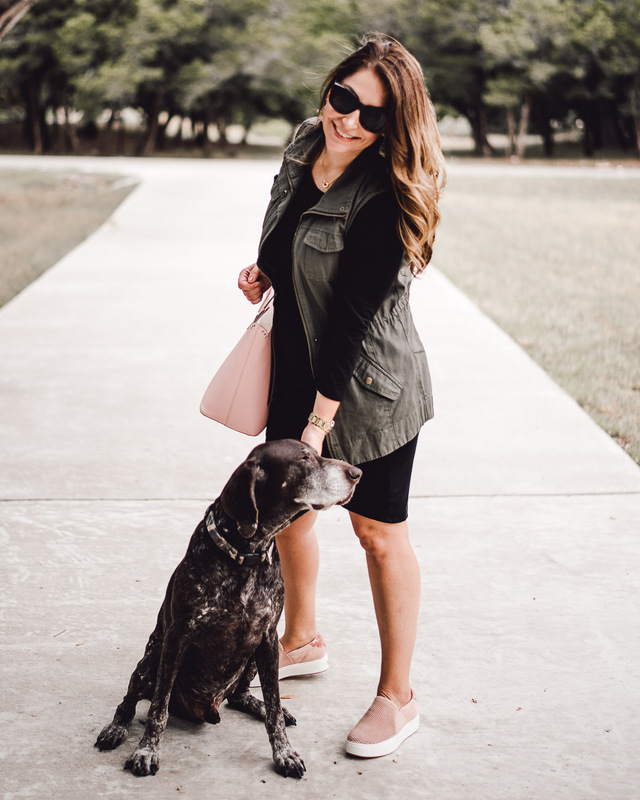 If you haven’t realized yet my Madewell Medium Transport Tote $158 is my go-to purse for it’s size, color and just overall awesomeness for more check out my post all about it here so it was added to my outfit since it’s what I would be carrying everyday. Although if you want a more inexpensive version Old Navy has one similar for only $25! I love Old Navy because it seems like they are always running some sort of promotion, so this outfit is not going to break the bank to look good at work! For everyone that has gathered around this little blog a HUGE THANK YOU I can’t tell you how much your support and love means to me! Keep in mind what keeps this blog running is affiliate links so please use the links on this page and on the Shop with Me Page. If you were to purchase an item from that link I would receive a small commission. Keep in mind not all links are affiliate because it is important to me to bring you the stuff I love, not just things I get paid on. If you want even MORE fun join me over on Instagram or request to join my VIP Facebook group. Also you can check out more of my looks on my new Shop Style page.